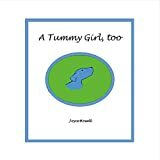 Tummy Girl, too is a picture book based on the author's dog, Nike. Nike got the nickname "tummy girl" when she was a tiny puppy with a sweet personality and a round, pink tummy. She loves to carry her chewing toys from room to room so she is always prepared for lots of play! Youngsters will ask again and again for the story about the cuddly pup with the funny belly. Joyce Howell is a college professor of art history, specializing in 19th and 20th-century drawing and art instruction. She resides in Coastal Virginia.